Vital Signs: Observation, Heart Rate, Hydration, and More! Learn how to take a horse’s vital signs and why it’s so important to know what’s normal in times of illness and injury. Knowing how to record vital signs and recognize what is within normal range for your horse is a crucial skill. The ability to interpret vital signs plays a key role in knowing whether to monitor the horse on your own or to call the vet immediately in an emergency, or when illness is suspected. It is also important to be aware of the normal mannerisms of your horse at rest and after work, so that even slight signs of distress will be apparent. Dr. Juan Samper, of Langley, BC, is the owner of JCS Veterinary Reproductive Services. In addition to his work in his private practice, he has been a faculty member at the Ontario Veterinary College as well as the Kansas State University Veterinary School. He is a past president of the Society for Theriogenology and North Eastern Association of Equine Practitioners. 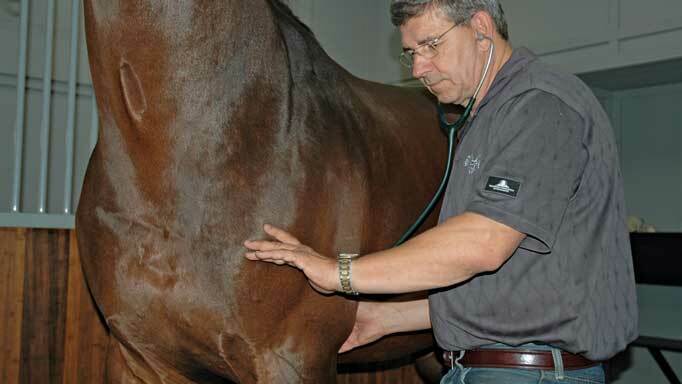 Here, he explains when and how to record and interpret your horse’s vital signs. The normal ranges for the vital signs depend on several factors, including age and fitness level of the horse. Some medications may also alter readings, and any medication should be noted when reporting findings to the vet. It is important not to administer medication unless specifically instructed by the vet, as it may mask symptoms needed to diagnose illness. The heart rate is most often monitored by listening to the heart with a stethoscope behind the left elbow, but can also be measured by feeling the pulse on the mandibular artery located under the jaw bone. A resting horse should have a heart rate anywhere between 36-42 beats per minute. Being aware of your horse’s normal resting rate is crucial, as it can vary depending on the individual. Count the heart rate or pulse over a 15-second period and multiply by four to get the reading. 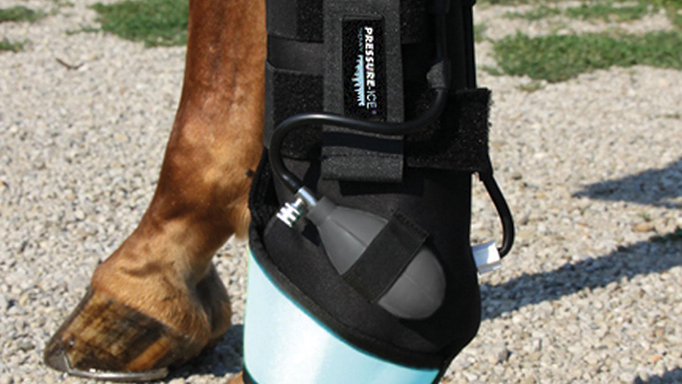 A digital pulse can also be located in the ligamentous groove under the inside of the forelimb fetlock. This is more a sign of any increased blood flow to the foot and an augmented pulse could be an indication of a foot abscess or laminitis. With the digital pulse, the emphasis is more on feeling the strength of the pulse rather than counting for a heart rate and determining if it is evident on one or both sides. 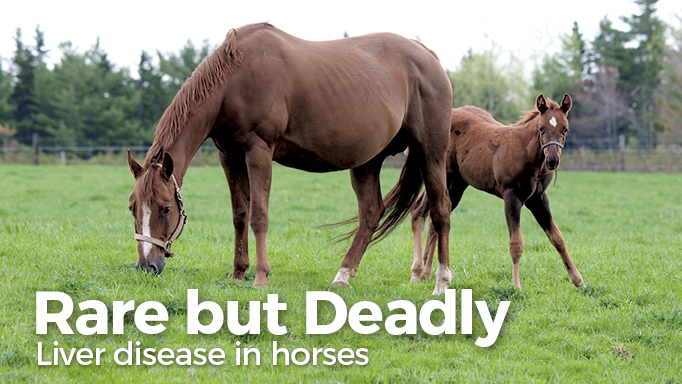 Dehydration and electrolyte imbalance can lead to an increased probability of colic. Though horses do retain a significant amount of water in their intestines to help in the digestion of forage, a depletion of fluids leads to a higher chance of impaction. Other signs of dehydration include mucous membranes that appear dry and a horse that is acting listless. Being aware of the normal amounts of water consumed by your horse is imperative. Horses lose important minerals as well as fluids as they sweat during workout, so electrolytes are a good option to maintain healthy hydration levels for horses in hard work. Capillary refill is measured by the amount of time it takes for the colour to return to the small blood vessels, or capillaries, in the gum tissue when it has been depressed, which in a healthy horse is generally two seconds. You can observe a horse’s respiration rate by watching the nostrils as the horse breathes. A horse at rest should take between eight and 12 breaths per minute. 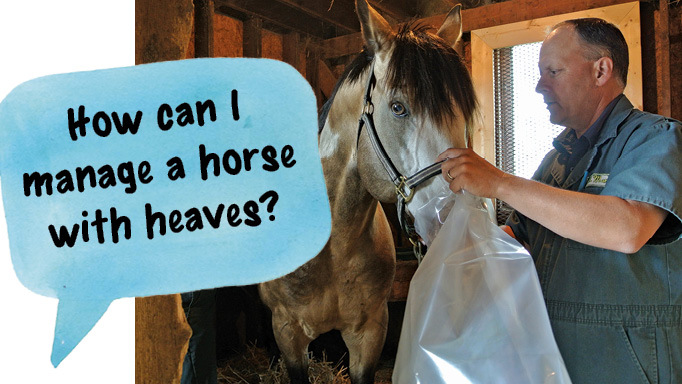 Be sure not to make the mistake of counting breaths as the horse is sniffing your outstretched hand, and this inquisitive sniffing is not generally indicative of normal respiration rates. Any sign of laboured breathing, especially if it involves any abdominal straining, is of serious concern and should be noted. Normal gut sounds are referred to as borborygmi, and are indicative of a normal intestinal movement. Gut sounds are a good sign, and you want to hear gurgling as the horse moves its feed along the intestines. Gut sounds should be assessed frequently if distress is evident, as they are a good indication of whether or not a suspected colic is improving or deteriorating. No gut sounds indicate an impaction or a twisted, gut. “Dead” guts don’t move and are extremely serious. A normal range of temperature in a healthy horse is 99-101 degrees Fahrenheit. Fevers generally present themselves with a virus or infection, but be aware of fluctuations that often occur during colder months or after exercise. Fever will generally present with some other forms of listlessness or unease that will alert you to a problem. “As the most accurate way to take the temperature is rectally, you have to be safe and make sure the horse knows where you are as you approach,” stressed Dr. Samper. “Always stand on the side, and though cow kicking is possible it’s not very common in my experience. We used to put a string on the thermometer when we used glass thermometers with mercury, but with the advent of the digital thermometers I don’t think it’s necessary. To minimize the risk of contamination, you should wash the thermometer before storing it away. Recognizing this rare but deadly disease. Dealing with a hoof abscess or injury? Learn how to poultice and bandage it like a pro. How and when to use the Rest, Ice, Compression, and Elevation protocol.